No matter what mode you're playing in Clash Royale, you just won't be able to win matches without a solid deck. 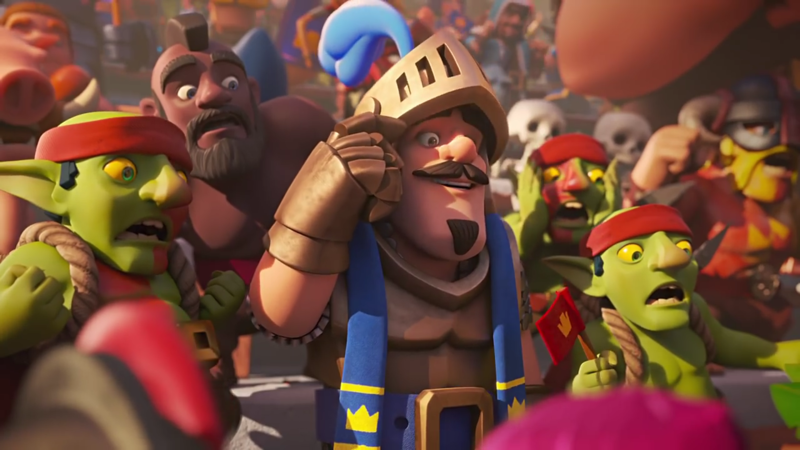 Clash Royale relies on three types of cards—troops, spells, and buildings—which players can use to both defend their own troops and attack the enemy's King's Tower. For those unfamiliar, cards use Elixir and come in four different rarity signifiers: Common, Rare, Epic, and Legendary. Suffice to say, Epic and Legendary cards are generally the best, although there's plenty of opportunities to use Common and Rare cards on the battlefield, especially when it comes to stacking units to attack your enemy's base. Because Clash Royale relies so heavily on creating the best possible unit stack possible to protect your towers on the battlefield, it's important to know which cards should constantly be in rotation during battle. 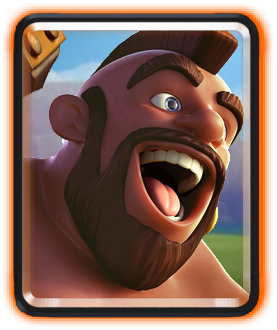 From the Giant to The Log, here's the top Clash Royale cards available for any deck. 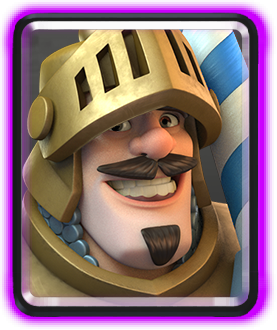 Whether you're a defensive or aggressive player, every Clash Royale deck needs troops on the battlefield. These cards serve as both the player's main offensive force as well as their defensive one, and in a pinch, deploying the right troops at the right time can earn you a victory. Among troops, here's some of the best cards worth having in your deck. Clash Royale's Minion Horde is an all-around upgrade to its Common sister, the Minion card. In exchange for five Elixir, this card spawns six Minions, who can fly around the battlefield and deal damage against an enemy's offensive tanks. While the Minion Horde is a little bit more expensive than other similar swarms, Minion Hordes do an excellent job wearing down enemy advances, protecting Giants, and helping with that final push for the King's Tower. Definitely keep one in your deck. 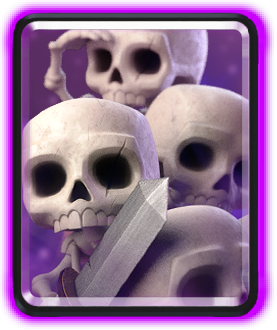 Unlike other troops, the Skeleton Army provides a low-cost mob that can quickly wear down enemies, especially tanks and other offensive-based cards. While the Skeleton Army is particularly weak against Arrows, Princess Towers, and the King's Tower, it still works well in an offensive push too. Try using it to round out a tower push by dealing significant damage to cheap defensive units and protecting some of the heavy-hitters leading the charge. Easily one of the strongest offensive troops available in Clash Royale, the Prince is a divisive card, but he packs quite a heavy punch with his charge against Princess Towers. While the Prince can be somewhat expensive, touting five Elixir just to use him, he deals significant damage and can tank quite a bit of health. He's perfect for wiping out structures, although bear in mind that he's weak against enemy mobs and can be easily countered without some protection. 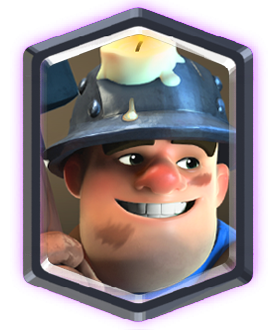 The Miner stands out compared to other troops because he can be placed anywhere in an Arena, making him great for catching your opponent by surprise. Use him to flank an enemy offensive, serve as a tank in a pinch, or wear down your opponent's Princess Towers while your they're distracted with an offensive push of their own. Definitely keep him in your deck, just use him strategically. The Ice Wizard is regularly considered one of Clash Royale's best cards, and for good reason. 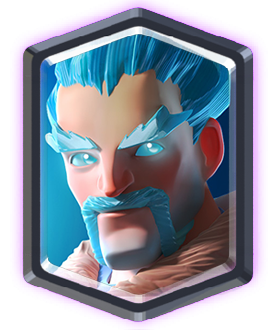 Costing only three Elixir, the Ice Wizard can stall an incoming offensive with his attacks, letting the player mop up incoming attackers with more powerful units. The Ice Wizard does just enough damage to kill cheaper units too, like Skeletons. Cheap, reliable, and great for counter-pushes, keep the Ice Wizard around in your deck, he'll cause endless grief to your opponents. Easily available from the very first Arena and onward, Hog Rider costs four Elixir and excels in battle against enemy towers. Just keep in mind that he'll only attack buildings, meaning that he's primarily an offensive troop—and utterly defenseless without some support. So if you're going to deploy a Hog Rider against your enemies, bring in some backup too. 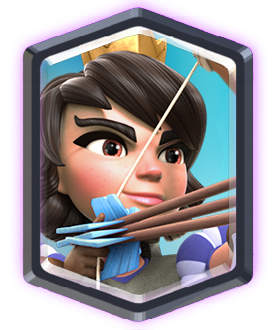 Like Archers, the Princess is a long-range troop that can deal damage from afar, making her great for both taking out towers, defending buildings, and supporting counter-pushes into the enemy's base. She sports moderate damage and an area of effect attack, plus she only costs three Elixirs to place in the Arena, making her a cheap purchase too. Just keep in mind that she doesn't last long on her own, especially when The Log or Arrows are in play. By far, the Giant is the foundation behind every push to the King's Tower. 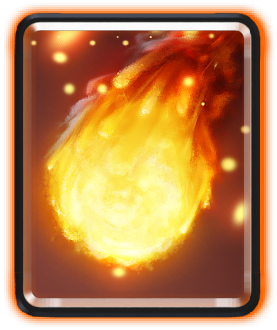 Tanky and powerful, the Giant simultaneously deals heavy damage while sustaining a large amount of incoming fire. After all, he's the troop with the second highest health in the entire game, which means you'll want to put him at the very front of all your incoming offenses. Stack your Giant with other troops to either defend him, wipe out weak foes, or further increase your DPS while landing that final blow against the King's Tower. 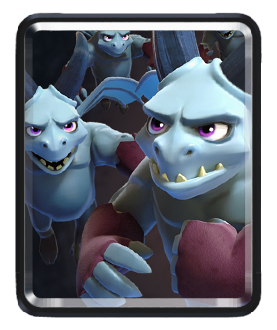 Spells are primarily defensive support cards in Clash Royale, giving players the opportunity to counter an enemy's incoming offensive or help their own troops survive on the battlefield. While you'll want to use spells a little bit more sparingly than troops, having a powerful set of attacks in your roster can help secure matches and wipe out incoming enemies. And to do just that, here's the best of the best spells in Clash Royale. Yes, Arrows may be somewhat common, but they're incredibly useful nonetheless. In a pinch, this spell can wipe out your enemy's cheaper swarms, like incoming Minions or Skeletons. 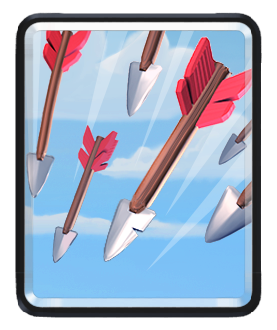 While you'll mostly want to use this card to protect your towers or offensive attack, it can even be used to chip away at towers, landing that killing blow when an enemy's King's Tower is at its last breath. If Arrows are good at sweeping away weaker enemies, then the Fireball is its tower equivalent. Touting a small area of effect, this spell deals significant damage against both tankier enemies and enemy structures. It's perfect against a swarm of enemies with higher health, too, such as a Giant with a Knight. 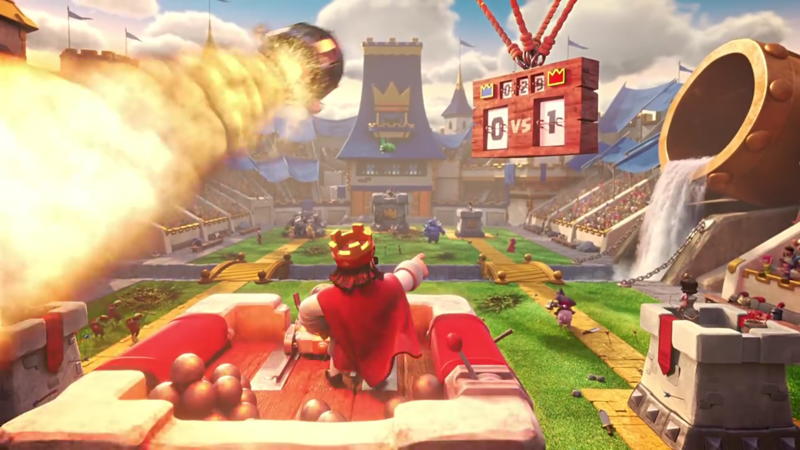 Use the Fireball in conjunction with incoming attacks to chip away at both Princess Towers and the King's Tower, leading to a swifter victory on the Arena. 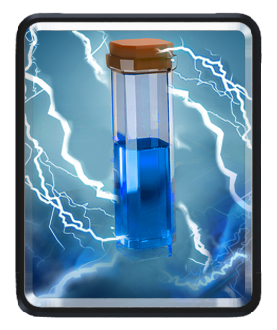 Like some of the other top spells in Clash Royale, Zap is an area of effect card that can be used to stun enemies and deal damage to bigger targets. This means it can simultaneously shut down incoming swarms while holding back bigger troops, giving players a spare second or two to counter an attack. Zap stands out because it's cheap too, costing only two Elixir to deploy. 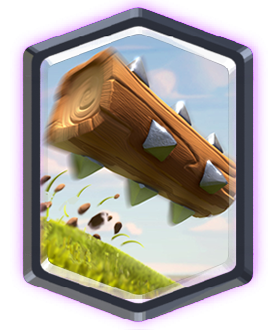 Praised as one of the most powerful spells available in Clash Royale, The Log rolls on the ground, knocks back incoming enemies, and damages any enemies in its path. This card only costs two Elixir to use, making it an incredibly cheap way to repeatedly push back an incoming offense, buy some time to build a counter-push, or simply damage an incoming Giant or Goblins. Of course, The Log can't deal damage to air troops, meaning you'll want to use it wisely on the battlefield. But if there's one spell to keep in your deck, it's this one by far. 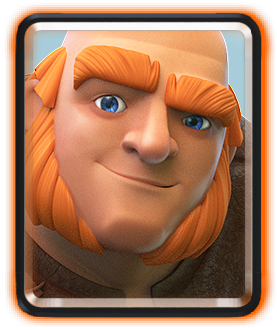 Clash Royale has a limited number of buildings, and unlike spells and troops, it's not uncommon to see these cards rarely deployed in the lower Arenas. In fact, some of the worst cards in Clash Royale are buildings, because they're static objects that eat up Elixir and don't allow players to dynamically counter incoming enemy offensives. But as you jump into the higher Arenas and start considering more advanced in-game strategies to defend your King's Tower, you'll want to make sure you have at least a building or two in your deck. Here's some of the best ones available in Clash Royale. 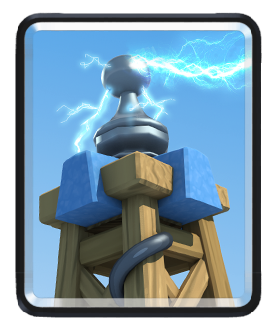 Costing only four Elixir, the Tesla can kill Minions, Goblins, and other swarm-intensive troops in just one hit, and it can deal some sizable damage against units with higher health as well. Plus, when it's done attacking, the Tesla hides underground and protects itself from ranged spells. While powerful against an incoming attack against your Princess Towers or King's Tower, just remember to use the Tesla alongside a larger defensive army to keep enemies from quickly knocking it down. 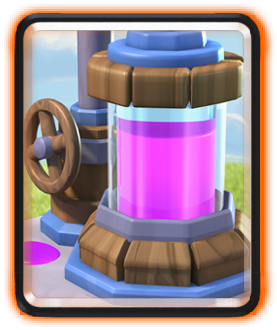 The Elixir Collector is a generator that provides extra Elixir in exchange for spending six to deploy it. For players that love spawning enormous armies on the fly, the Elixir Collector is a strong pick, especially for Skeleton Armies and Minion Hordes. Bear in mind though that the Elixir Collector has low HP and is is better used in a support role when the enemy isn't on its way to your King's Tower. Otherwise, your opponent can easily shut down your Elixir boost on the way to their victory. 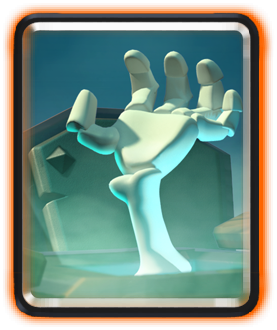 Generally speaking, higher level Clash Royale players tend to avoid troop-spawning buildings, but the Tombstone stands out thanks to its Skeleton production rate. Like the Skeleton Army, the Tombstone's Skeletons can target offensive units and slow down an incoming assault, giving a boost to player's defenses during tight situations. The Tombstone only costs three Elixirs and can spawn 18 Skeletons, including four upon its demise, meaning the Tombstone gives players a steady income of Skeletons as long as they're fine collecting the units one at a time.